Nishan-e-Haider is the Highest Military Award of Pakistan. Nishan-e-Haider means “Emblem of Haider”, where Haider is the epithet of Hazrat Ali and means Lion. Nishan-e-Haider was established on 16 March 1957; however it was applied from the date of Pakistan's independence on 14 August 1947. Nishan-e-Haider is made of gun metal, captured from the enemy in the previous wars, with a green ribbon and a star with five points is awarded to soldiers who show great bravery and courage in war or on active duty. All recipients of "Nishan-e-Haider' gave away the most valuable thing they had - their lives – in serving the nation and in defending the frontiers of Pakistan. It is named after the name of Hazrat Ali (R.A), fourth caliph of Islam. Gun metal used for its manufacturing, is captured from the enemy in the previous wars. It is only awarded to personnel of Armed Forces of Pakistan, without any discrimination of rank. So far total 10 Nishan-e-Haider awards have been awarded, to 7 officers and 3 soldiers. Nine Nishan-e-Haider recipients have been from Pakistan Army and one from Pakistan Air Force. All the 10 recipients got this award for fighting against India. One Nishan-e-Haider was awarded for the 1948 war, one for 1958, one for 1965, five for 1971 and two for 1999 Kargil War. Nishan-e-Haider is only awarded posthumously (awarded only to those armed forces personnel who have lost their lives, fighting with the enemy or performing their duty). Hilal-e-Kashmir (posthumous) is declared as equivalent to Nishan-e-Haider by Government of Pakistan. Here is a brief account of these men, who would be remembered for their feats of courage, bravery and selflessness. He was awarded Hilal-e-Kashmir - an equivalent to Nishan-i-Haider. 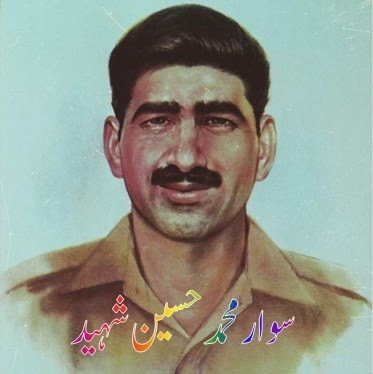 On 14 March 1949, the Defence Council of Azad Jammu and Kashmir adorned Naik Saif Ali Janjua Shaheed with Hilal-e-Kashmir (posthumous) and on 30 November 1995, the Government of Pakistan initiated the gazette notification to declare Hilal-e-Kashmir equivalent to Nishan-e-Haider. Total how many Nisan-e-Haidar have been awarded?11 or 12? Salute to them . . . !!! Great people who sacrificed their lives to protect their home land and it's people. May Allah Shower His blessings on them. Aamin!! Love you all... Nd salute you.. I proud on we are pakistani. Pakistan zindabad pakistan army zindabad. 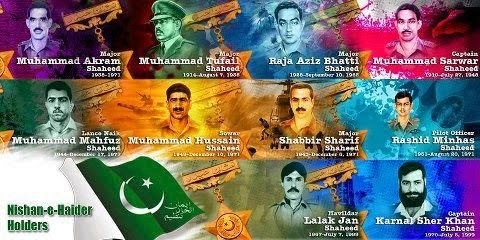 True Heros, Nation is indebted to them & their families ! ABDUL SITTAR EDHI SHOULD AWARDED WITH SOME GREAT AWARD. NISAN E HAIDER IS VERY LUCKY THAT IT IS AWARDED TO SUCH BRAVE HEROS. You've lost your mind completely! Bughz e Ali jeenay nahi deta! I always love my heroes. Allah pak jannat ul firdoos me aala mukam aata farmeye. we have proud to be pakistan..